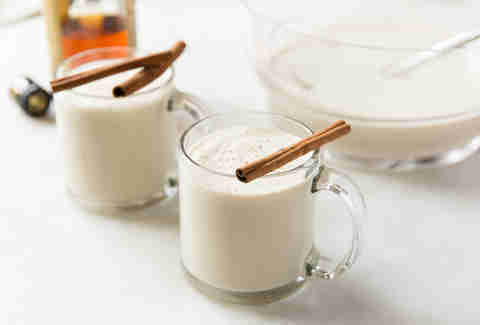 According to Dos Caminos chef Ivy Stark, Mexican nuns make the ultimate eggnog. Called rompope, they serve it to raise money, and there's no disputing that -- aside from God -- nog is primarily their turf. Stark had her first taste as a teenager on one of her many trips to Mexico. She has since perfected her own recipe, with the help of her Dad, who makes a mean eggnog (for not being a nun). Richer and rummier than the American version, this take on the Mexican recipe uses spiced rum instead of brandy, and adds ground almonds to thicken it up. Just make sure you're using the best-quality milk (never reduced-fat), vanilla (never imitation), and rum (añejo if you can, though Captain Morgan will do). The addition of cinnamon-sugar bacon is certainly not traditional, but Stark wanted to play off the idea of "bacon and eggs". And for that, I think we can all say "hallelujah". Dos Caminos is serving rompope ice cream at all locations through January 2nd, 2015, and Stark promises she'll be cool if you bring along your own eggnog to pour on top of it. Feliz Navidad! Combine milk, granulated sugar, almond meal, vanilla, and cinnamon stick in a large saucepan. Bring to a boil over medium heat. Reduce heat to low and simmer, stirring constantly, for 15 minutes. Remove from heat and let cool to room temperature. Beat egg yolks until thick and light yellow. Remove the cinnamon stick from the milk mixture. Gradually whisk the egg yolks into the milk mixture. Return to low heat and cook, stirring constantly, until the mixture is thick enough to coat a spoon, about 10 minutes. Remove from heat and allow to cool completely. Add rum to the mixture and stir well. Transfer to a glass container, cover tightly, and refrigerate overnight (or up to 2 days) before serving. Prepare the bacon about 20 minutes before serving. Preheat oven to 350℉. Line a baking sheet with foil and set a wire rack on top. Combine brown sugar and ground cinnamon in a shallow bowl. 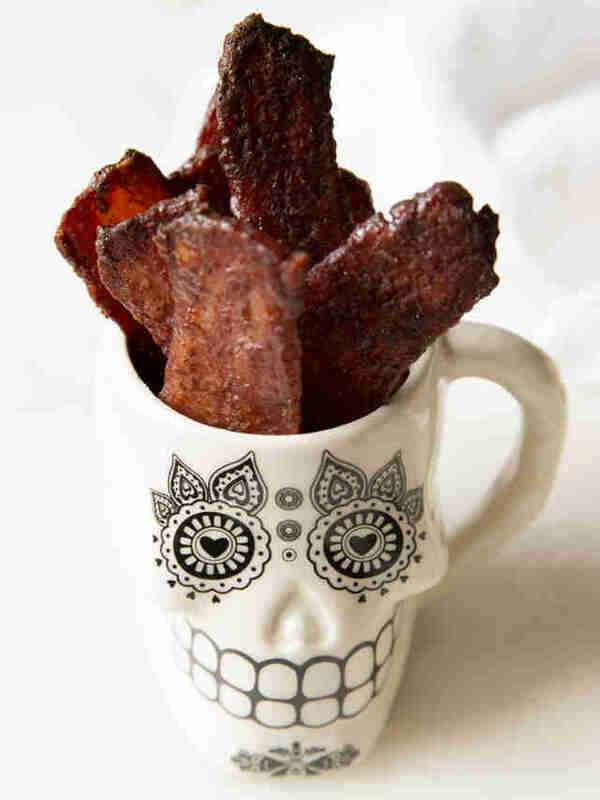 Dip bacon in the cinnamon-sugar, and spread the strips evenly on the rack. Bake for 15-20 minutes, or until crispy. 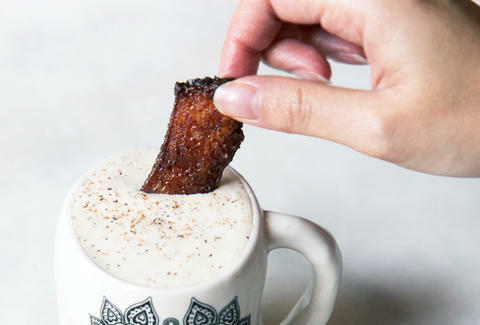 Pour eggnog into mugs, sprinkle with allspice, and serve with warm cinnamon-sugar bacon.